(PhysOrg.com) -- Children as young as three have composed serious music which deserves to be ranked alongside more established works by older composers, a renowned music scholar has said. Professor Barry Cooper, from The University of Manchester, has investigated more than 100 child composers from music history, for a book published this month, to conclude that children’s work has often been unfairly judged - because of their age. The famous - and not so famous - who began composing proper music before the age of 16 have left behind a body of work which should not be written off, he said. ”If someone is serious enough to compose - which after all is no mean feat - then we should take them seriously too - whatever their age,” he said. 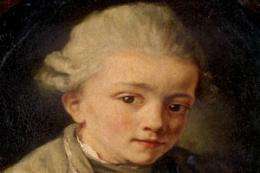 Apart from the most well known child composer, Mozart, composers such as Liszt, Saint-Saëns, Franck, Handel, Beethoven, Mendelssohn and Richard Strauss all composed at very young ages. Many lesser figures did too. Examples found by Professor Cooper include an English composer called Frederick Ouseley who composed a “perfectly satisfactory” piano piece at the age of three years and three months, notated by his sister. Camille Saint-Saëns’s first composition was written when he was just one month older than Ouseley. However, not all great composers began at such tender ages: Bach, Stravinsky and Haydn, for example, apparently did not start until their late teens. Professor Cooper said: “Sometimes a composer’s works as a child are relegated to an appendix under a subheading entitled juvenilia - as though they’re somehow less important. Examples suggested by Professor Cooper include a sonata written by Beethoven at the age of 12 in which, for the first time ever, the slow introduction reappears later on. The idea became a common feature of sonata form which Beethoven used in the Pathetique Sonata and three of his late Quartets. In another example, Chopin composed a polonaise printed in 1817 at the age of seven. The piece begins in a minor key and ends in a different major key which was later changed by some editors it because they thought it must be wrong. But in later life Chopin wrote important pieces that did just that, for example the Fantasy Opus 49 in F Minor ends in A flat Major. Professor Cooper added: “There is certainly cultural resistance to child creativity and not just in composition. “I’ve come across many cases where writers have unfairly dismissed children’s works - sometimes without even hearing them or looking at them. “I think over recent years, there’s less prejudice now than there was- but it’s still there. “I’m not saying that all composition produced by children is good or musically correct - but that’s the same for adults too. “The point is, children who compose are often described as prodigies, seen as somehow freakish - when all they are is creative. “And it’s sometimes assumed, when the music is really good, that they must have had help, when they didn’t. Perhaps the best example of intolerance, listed by Professor Cooper is Franz Liszt’s ‘fine’ opera of 1824-5 which he wrote and had performed when he was 13. Don Sanche ou le château d’amour was dismissed by one writer as ‘thin and immature’ on the basis of its title alone. It is still not available in print. • Franz Liszt (1811 - 1886) wrote an opera when he was 13 called Don Sanche, ou le chateau d’amour”. • Carl Eckert (1820 - 1879) was a German conductor and composer who was composing by the age of five and wrote an opera at the age of 10. • Frederick Ouseley (1825 - 1889). This Englishman began composing at the age of three and a quarter, with a piano piece which was written down by his sister. He became a priest and minor composer of mainly church music. • Camille Saint-Saëns (1835 - 1921). His first composition was when he was three years and four months old. • William Crotch (1775 - 1847). From Norwich and born in 1775, he began playing the piano with proper harmony at the age of two. He wrote a very fine oratorio (rather Handelian) between the ages of 10 and 13, but never became as famous as Mozart. • Erich Wolfgang Korngold (1897 - 1957) has been called the ‘last prodigy’. He wrote some outstanding music at the age of 12 and 13 and went on to write for Hollywood films -more or less creating the Hollywood style. • George Frideric Handel (1685 to 1759). Handel wrote hundreds of pieces as a child which have been neglected and lost. • Henry Purcell (1659 to 1695) published a song when he was eight, but some say he was too young to have done so and the song must have been by his father (who was not a composer and was dead by then). • Philippe Basiron (c. 1449 -1491) may have been the earliest known child composer, since he instructed boys at an early age and had composed several pieces by the age of 20.